Ray-Check precision I.Q.I.s rigidly conform to and exceed requirements of each code and MIL-spec. Lead figures identifying the penetrameter size and in the case of some MIL-specs the material, are affixed to the penetrameter. Each penetrameter is chemically etched identifying the material and specification. Sharp smooth edges with accurate, perfectly spaced, drilled and reamed holes, ultrasonically cleaned, give the technician every advantage in obtaining clear, well defined images on the radiograph. Copies of material certifications are available on request. All penetrameters are accompanied with certification and is traceable to the National Institute of Standards and Technology. I.Q.I.s may be serialized and calibrated resolving to the 4th decimal, for a nominal charge. Penetrameters may be encapsulated in clear thin walled plastic if requested. This leaves I.Q.I.s hermetically sealed. Cost is nominal. 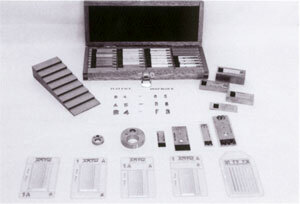 Stock Penetrameters are usually available for immediate shipment. Stock I.Q.I.s are standard sizes within each code. Our Products are Sold Exclusively Through Reputable Dealers Throughout the World.